My wife uses it on her bike. In a group ride you can see her from a mile. One of the strongest rear light you can buy. You need to charge it regularly, I mean before every single ride. I purchased this in hopes of gaining some peace of mind during night rides. Mostly while pulling my one year old son in his bike trailer. I certainly have gained that peace. All light modes are very noticable, the battery life is great. The laser lines beam a path from in front of my bike to behind my son's trailer. Truly a durable and dependable tail light. Highly recomended! The strongest rear light I've ever had! My wife use it on her bike. She stand out for a mile! The LED is bright, many types of light flashing modes and the laser LED lane light that it marks out behind you is awesome! The laser lanes are surprisingly bright but I tend to doubt that they are noticeable to a car. Regardless, this is an excellent light, very bright and a wide variety of settings. Really great bargain at retail price. Like the laser and ability to turn it off if in a group ride and don't need it. The only issue I have is the positioning of the light with my bike (2019 Giant Defy Advanced 1). The angle is too far forward so the laser function isn't too helpful because it doesn't extend too far behind me since half the laser beams are in line with my bike. I just wad up some paper towels behind it to point the light up a little and it solves the problem though. This light probably needs a review after much study of battery levels at each flash level. I did not do this. Suffice to say, if it is brighter or more complicated in its flash, it will burn the battery faster. I did notice one time that the light automagically changed from a complicated flash pattern to a basic onoffonoff when the battery level gets low. Presumably, to preserve the battery. I do think it will last for most rides and you will be happy. So here's the thing. Where to attach? I have a gear bag (smallish) under and behind the saddle. Typical. However, my gear bag has one option for attachment on the back and it is in the wrong orientation for the rubber band thing that comes with the light. The seat post actually was not a clear place for me to use because of the bag and the tire blocking the beam. If you do not have a seat bag then you will be fine. I fiddled with a couple options. One option even bounced the light off onto the asphalt. The light survived the fall at 15 mph! The best option was a black 12-inch Gear Tie by Nite Ize from Home Depot that I snaked through the bag attachment, the light, and a couple twists. The gear tie was stiff enough to hold the light in place without too much wobbling and bouncing. The black matches the bag so it doesn't look too redneck. Testing of the DayFlash 250 indicates the light's duration is as advertised. In that mode I can see the light for over a mile, and indoor testing resulted in some comments from my neighbors. I should have put the light in the closet. It's very bright. Haven't used the laser - yet. Nice to have this feature though. Having the light remember the last setting turns out to be critical to easy usage as there are a lot of modes to step though otherwise. Wish it had a back step as well as a forward one. I like the mounting system. It's rock solid and just makes sense. I never understood all the mechanism in the mounting system of other lights. This light mounts quickly, easily and rock solid every time. It's also very streamlined. The USB charging port is such that you can't charge the light when it's mounted on the bike. On the other hand, you can't roll your bike away with the chord still plugged in. The USB port is also covered in a rubber plug that is pushed against the seat post by the mounting strap. A simple, effective way to keep the port covered and out of the rain. TIP Plugging a USB chord into the light when it is running automatically turns it off. When you turn it back on it comes on in the mode you were using it before. A very nice feature. 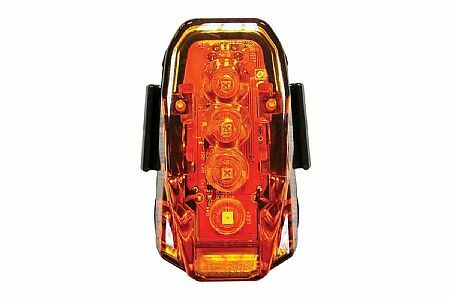 This light is bright, lasts long and has the cool lane indicator beams! Battery seems to last too. Even in the cold weather here.